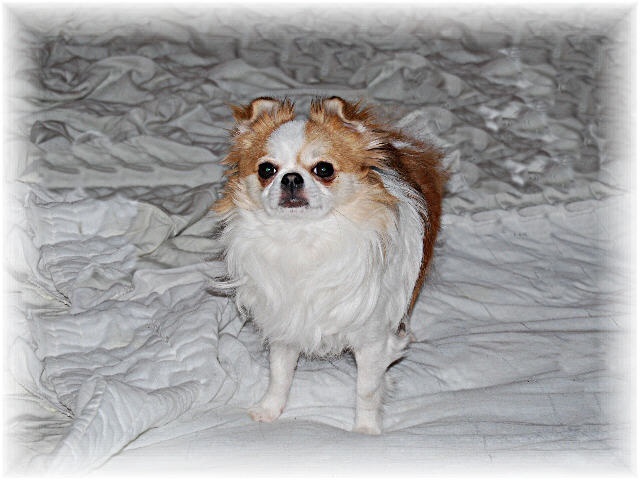 Methos is AKC and CKC registered, and comes from championship Bloodlines. 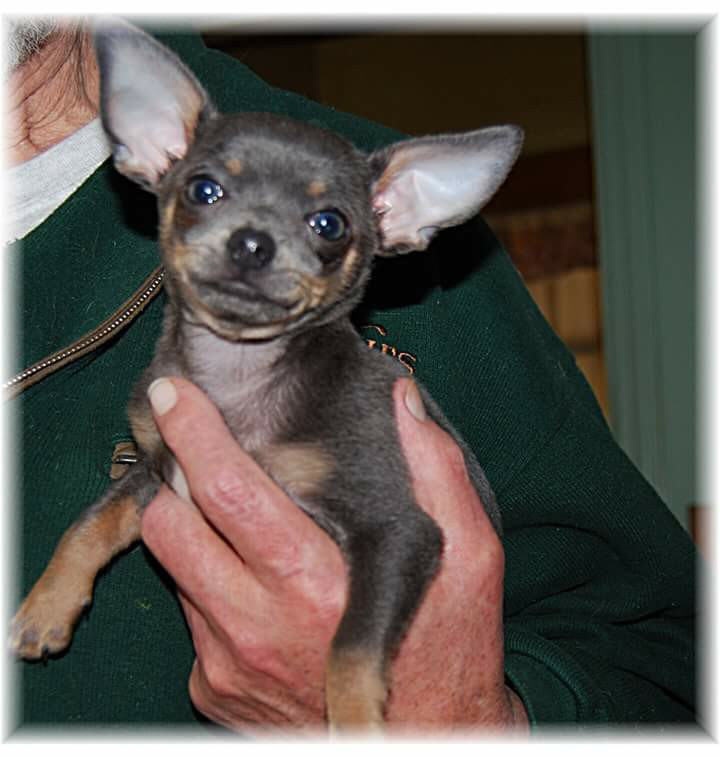 As an adult now, fully grown Methos weighs about 4 pounds Methos is a proven stud, with many EXCELLENT PUPPIES to his credit. He comes from tiny stock. 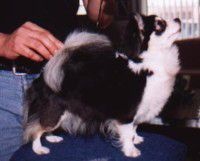 his history, and Bloodlines have been researched back for several generations, revealing tiny progeny for all generations. 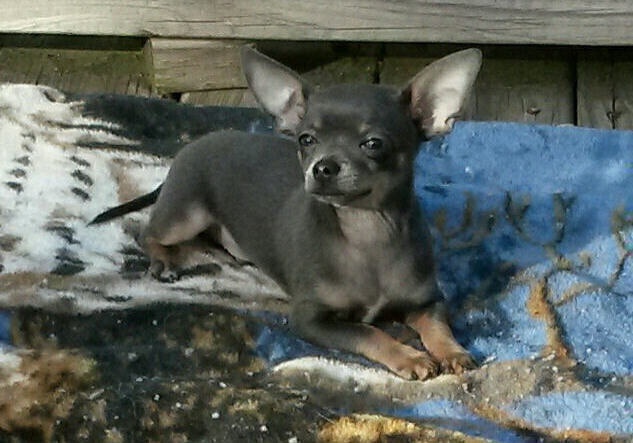 Methos has produced outstanding puppies in many colors including, Blues, Brindles, Whites, Fawns and Blue fawns. We Love this Little guy Dearly. He is a Wonderful, Gorgeous, Fun loving Out going little Character. Methos is NOT for sale or available for stud. This is ** JASPER**. 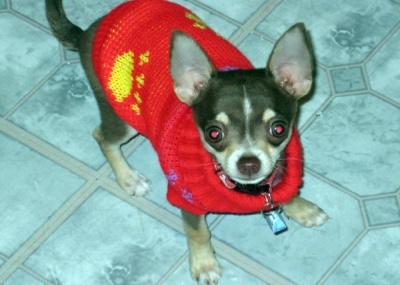 All grown up now, he is a very, Little Dude, weighing just 3 pounds. 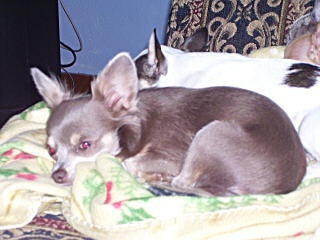 Jasper is a Flashy Tri-Color Chihuahua His coat is a Gorgeous chocolate and white, with cream markings. 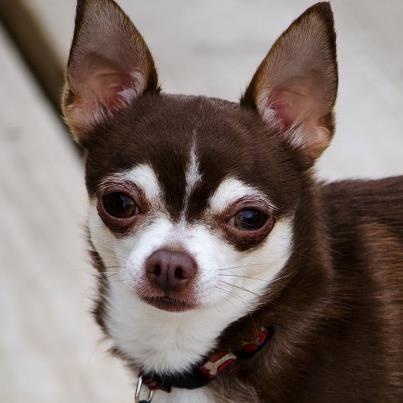 Jasper has magnificent Green eyes, which is Very Rare in a Chocolate Chihuahua. This is an Exotic trait. (Sorry the camera makes it look like he has red eyes.) He comes from Champion Bloodlines, and he is Show Quality. 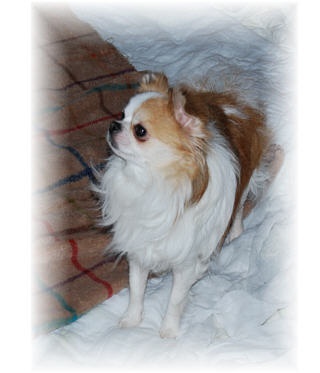 He is registered CKC. He is so very friendly, He loves everyone. The minuite he meets you it is like he has known you forever. He loves adults and children, and even cats..lol..He is Wonderfully outgoing. Some of his favorite things to do are playing with his toys, and going places in the car. God how he loves going in the car, it doesn't matter where, just as long as he can look out the window and wag his tail at everyone he sees..lol.. Jaspers personality is so perfect, and he is so very intelligent, we are excited to say he will be training soon to be a therapy dog..yea.. Jasper has a Perfect Apple Head, Perfect Conformation, Perfect Temperment, Perfect Topline, And an absoultely Perfect tiny, tiny size, and you will never find another dog with a more Perfect loving Nature!!!! WITH ALL THIS GOING FOR HIM....WELL YOU JUST HAVE TO SAY....LITTLE LORD JASPER JUST HAS IT ALL!!!!!!!! Here are several pictures of Jasper. Jasper is NOT for sale or available for stud. Jasper has Gorgeous Puppies, and most of his Puppies have been very Tiny. Some will be in the Tea-Cup range as adults. And he has produced Fantastic exotic colors also. His puppies are Merles, Blue Brindels, Chocolates, Chocolate Brindels, Silver Fawns, Creams, Champagne, and Chocolate Tri-colors Like he is. My Dear Friend Patty has captured a picture of Jaspers Gorgeous Green Eyes..LOL..not an easy thing to do. They usually want to come out red instead of Green in most of his pics..lol.. This is Octavian. 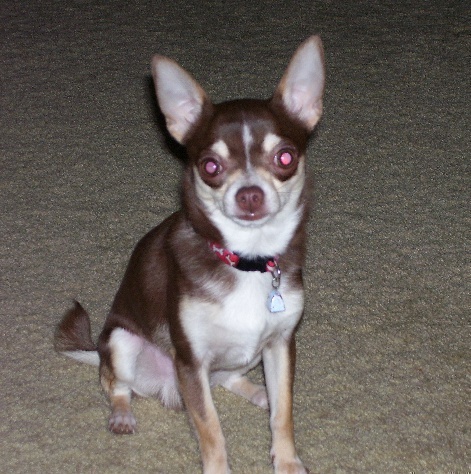 His AKC registered name is ****VICTORY'S OCTAVIAN CARPE DIEM**** Carpe Diem is Latin. In English it Means Seize The Day..LOL..And that is Exactly what this Perfect Little guy does. 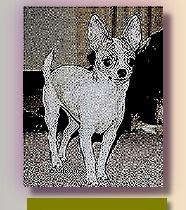 Our Gorgeous Tiny Octavian is co-owned by myself and my Good friend Helen. 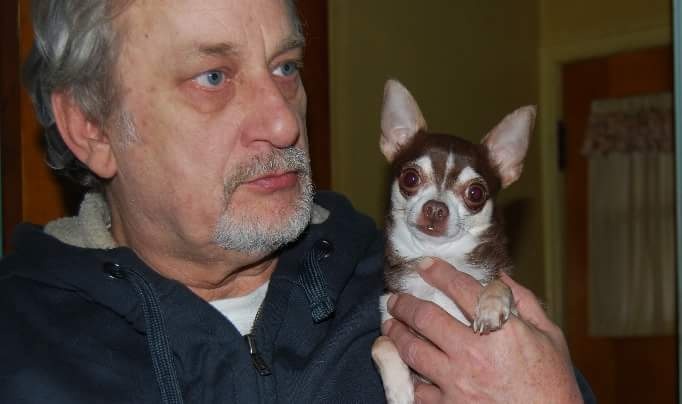 He lives with Helen and her husband Peter, But he is available to me for stud when ever I wish. 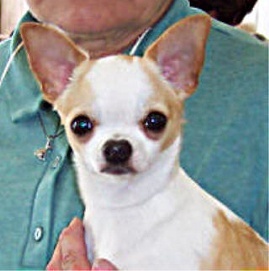 Octavian is a Super Gorgeous Show Quality Chihuahua. 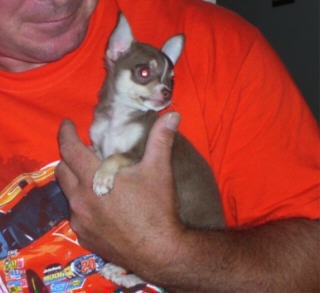 He is AKC registered. 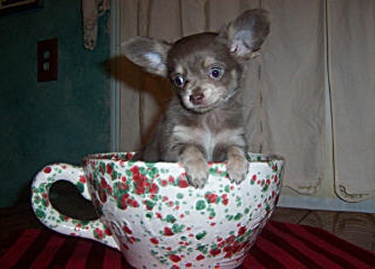 He is a Little guy weighing just 3 and a half pounds. I love when I get a chance to go visit with Octavian, he has such a Sweet and friendly personality. He is always excited to see me, and loves when I bring him treats. I just Love this Little Guy. I am very much looking forward to him Sireing Puppies with my Girls. Thank you Helen and Peter for Sharing your Awesome Octavian with me. Octavian is NOT for sale or available for stud. A couple years back Octavian was cast in some Commercials for Oscar Mayer. They aired in Canada for a while. What a Little Celebrity..lol.. 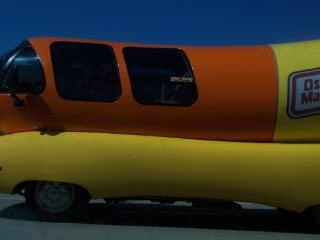 Here is a pic of him in the Oscar Mayer Mobile. 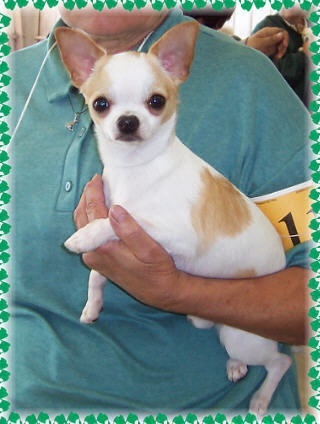 * CH SAMAJOTO'S ONE N ONLY KNOCKOUT* Is a USA AKC Champion and also a Canadain Champion. And also a Champion from Japan. He is a Gorgeous White and Red. 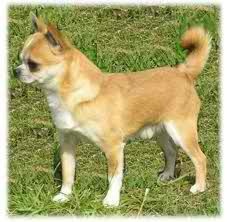 I have never seen a Thicker, more Gorgeous Coat on any Chihuahua before. Trig weighs 4 pounds 2 oz. We are Beyond Excited, and feel Privileged to have such a wonderful Stud as Trig. His Pedigree is Filled with Champions!! He is Gorgeous With the most Wonderful, and Friendly Temperment of any dog I have ever met. He lives with my friend Jane, and we will be sharing him for stud. Below are more photos of **TRYGVIE** And photos of his champion sire. his Grandmother, and Grandfather, and others in his Championship Bloodline. Trygvie is NOT for sale or available for stud. Below are Photos of Prestigious Champions in Trygvie's Pedigree. His Daddy is a 3 time Champion, and there are Many, Many More. He has an Excellent Champion Bloodline. THIS LITTLE GUY IS VLAD. HE IS SO PERFECT. VLAD IS A LITTLE GUY WEIGHING ONLY 2 POUNDS 12 OZ. HE IS A GORGEOUS BLUE AND TAN. WE CALL HIM BABY GROOT.. This is ** VAIGO VLADISLAV DEACON **. VLAD is a Very, Very Little Dude, weighing just 2 pounds and 12 oz. 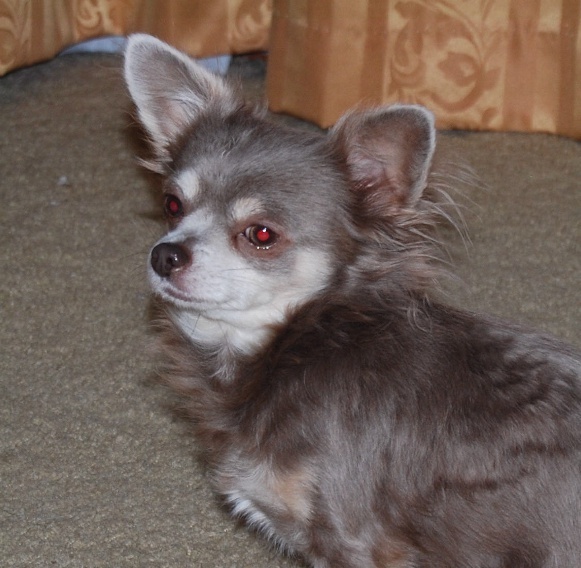 Vlad is a GORGEOUS Chihuahua His coat is a Fabulous Blue. Vlad has magnificent Blue eyes also. This is a Extremely Stunning Eye Color. He comes from Champion Bloodlines, and he is Show Quality. 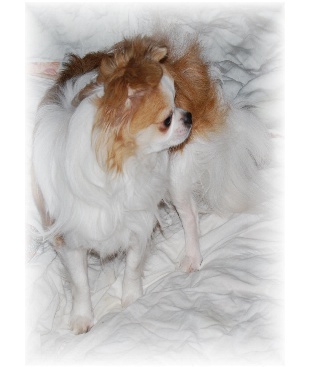 He is registered CKC/AKC. He is so very friendly, He loves everyone. The minuite he meets you it is like he has known you forever. 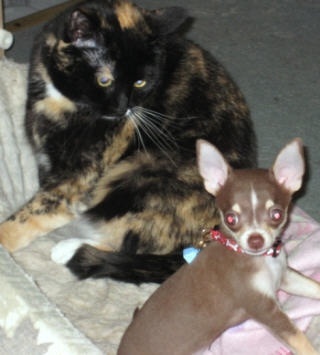 He loves adults and children, and even cats..lol..He is Wonderfully outgoing. Vlad Loves nothing more than Basking in the sun, and Snuggling on my lap. Well he Loves Snuggling on everyones Lap. He loves going for car rides , and running and chasing Squirles.Vladislav has a Perfect personality, and he is so very intelligent. With Perfect Conformation, Perfect Temperment, Perfect Topline, And an absoultely Perfect tiny, tiny size, and you will never find another as Perfect as Vlad..